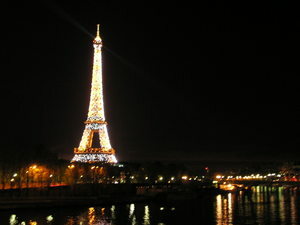 Hi, we hope that you are having a wonderful time in Paris. We are envious! and hope the rain stays off for you. Enjoy every minute! Love from Emily, Mum, Dad and Suzie who is missing you also. The Eiffel Tower looks fantastic. Hope the weather is good so you can see it at it's best. Rememeber to save some energy for tommorrow 's big rides. Did you find anybody to go on the scary ones with you? Your Dad is jealous! How's Paris? You can go on those big rides with Amy Ruickbie. Just stay off the spinning ones, remember Kirkcaldy!..and no more big stuffed animals please. Hope you're having a great time in Paris. I'm still sleeping in your bed! I promise I've kept your room tidy! Enjoy all the rides - I wish I was there!